The flags have primary themes of peace and unity. In Tibet, prayer flags flying in the breeze are an ancient tradition. As the wind moves the fabric, it's thought that the intentions of the prayer are spread across the land. Closer to home, an artist is hanging flags across the Lehigh Valley bearing hopes and wishes for a new year and Washington's new administration. By Tuesday, Inauguration Day, Jane Noel of Lower Macungie Township hopes to have more than 1,000 flags flying at 11 locations. Some, like the flags to go up this week at Cedar Crest College in Allentown and the Banana Factory in Bethlehem, will be outside. Others, like the 200 hung Sunday at American Hairlines in Bethlehem, will be indoors. Noel began organizing flag-making workshops last summer at locations including the Riverside Arts Festival in Easton, the Emmaus and Easton farmers markets, and Christkindlmarkt in Bethlehem. She supplied the materials -- blank squares of fabric, multi-colored paints and stamp pads, brushes, pens and markers -- and asked people to supply their thoughts. The project was inspired by bad news headlines and last year's political campaigns. "I wanted to do something that was positive in the whole election cycle," she said. "I wanted to work together rather than working against. The whole thing started without an eye to either candidate." The flags will stay up for about a month, "the honeymoon period after the inauguration," Noel said. Noel, who recently left a longtime job as a lecturer in art, information sciences and technology at Penn State Lehigh Valley, saw the project as a way to connect with local organizations and people. "People have been very positive in their response to the project," she said. "Some said that taking some time out of their day was refreshing. If it manages to bring a smile to someone's face, that's great." 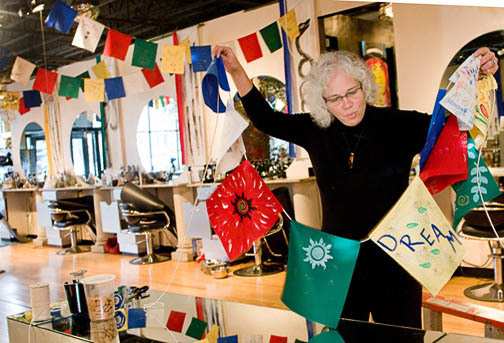 What: Flag project by artist Jane Noel, Lower Macungie Township; 1,000 flags created by volunteers to be hung across the Lehigh Valley by Inauguration Day. Why: To symbolize wishes for the new year and the new administration. Where: Indoors at American Hairlines and Northampton Community College Fowler Family Southside Center, both in Bethlehem, and Allentown Fairgrounds Farmers Market. Outdoors at the Banana Factory, Bethlehem; Wellspring Spiritual Center and Penn State Lehigh Valley, both in Fogelsville; Amber Connection, Cedar Crest College, and Noel's studio, 2050 S. 12th St., all in Allentown; downtown Emmaus, and Easton Centre Square.